REPORTS FROM AN AIR FORCE RESERVE HURRICANE HUNTER AIRCRAFT INDICATE THAT MAXIMUM WINDS ASSOCIATED WITH ISAAC HAVE INCREASED TO 75 MPH...120 KM/H. ON THIS BASIS...ISAAC IS BEING UPGRADED TO A HURRICANE. So, there you have it. Hurricane Isaac, a Category 1, bearing down on southeastern Louisiana, on what would be a catastrophic track if this were a major hurricane. Thank goodness it's not; thanks goodness for dry air. That said, Isaac may yet strengthen a little more before landfall tonight. But the main threats will be storm surge and rainwater flooding, and perhaps inland wind and widespread power outages (particularly if Isaac does intensify just before landfall, which would imply that it will remain strong over land for a longer period of time). To watch Isaac on satellite and radar, and to track the surge with live tidal gauge data, view the post below. And again, for the very latest, follow me on Twitter. UPDATE, 2:30 PM: All along the Louisiana and Mississippi coasts, the water is rising as the storm surge comes in -- even as it "should" be receding, now that we're past high tide in most places. Take, for instance, the data from the tidal gauge in Shell Beach, Louisiana (which is located here, for reference). The red line is the water level; the blue line is what the water level "should" be doing, absent Isaac. The green line represents the storm surge (i.e. the red line minus the blue line). The next high tide throughout most of these areas is around midday tomorrow. (The Gulf of Mexico has diurnal tides.) On the projected track, Isaac will continue piling water onto the shore throughout the ~24-hour period between now and then. If the surge continues to prevent the tide from going out, as it's doing right now, that next high tide could be a significant problem. I've been playing down the storm surge threat a little bit, comparing it to the "hive, not pimple" phenomenon of Ike and Irene, whose surges were underwhelming as compared to the dire projections. But the trajectory of the green surge line on graphs like the one above, combined with the sheer amount of time Isaac has left to keep driving the surge on shore, has me concerned now. Life threatening flooding possible in areas outside hurricane protection levees and in areas around Lakes Pontchartrain and Maurepas. Sections of west Jefferson, east St Charles and lower Lafourche hurricane protection levees could be over topped. Areas outside of hurricane protection levees will be severely inundated. People not heeding evacuation orders in single family, one or two story homes could face certain death. Many residences of average construction directly on the coast will be destroyed. Widespread and devastating personal property damage is likely elsewhere. Vehicles left behind will likely be swept away. Numerous roads will be swamped. Some may be washed away by the water. Entire flood prone coastal communities will be cutoff, perhaps for more than a week. Water levels may exceed 9 feet or more behind over topped levees. Significant storm surge flooding will move well inland especially along bays and bayous. Coastal residents in multi story facilities risk being cutoff for a week or more. The water level is also rising in and near Lake Pontchartrain. (I can't embed that graph, alas. But go look at it!) 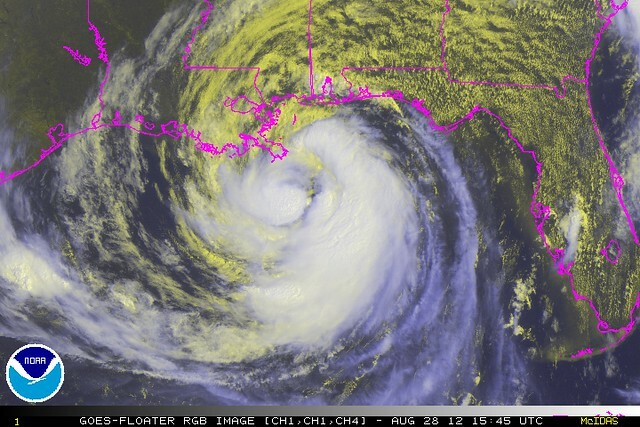 FWIW, Katrina caused these gauges to get up in the 9 to 12 foot range. Lots and lots more tidal and lake/river gauges here. Watch the storm surge in real time. And -- again -- for the very latest, follow me on Twitter.